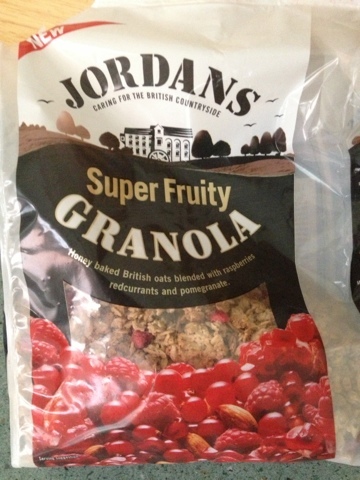 I reviewed the Dorset cereal Red version previously, and this is the review of the Jordan's equivalent. This comes in the eco-friendly 'just a bag' packaging which I approve of, and it makes it a lot easier to store. While fundamentally the two cereals are doing the same thing this one appears to be more traditional granola and less about the seeds. It also appears to have more of the stronger flavoured red berries which I like. The mix is raspberries, redcurrants and pomegranate (yay! although its just apple pure flavoured with pomegranate) which is quite a variety, and although we've debated about the existence of super fruits in the past it's certainly better for you than Frosties (sorry Tony). They never specifically say that the contents are superfruits, just super fruity, so the dodgy science is avoided and everyone has a good time! The oaty mix is really quite nice, and I think of the two cereals I prefer this one. The bags are again premium priced, but not to the extent that I'm worried about it - it's more of a weekend cereal anyway. I'm always happy to try raisin free, fruity cereals and this is one of the best I've had recently.